Chocolate and mint is not a combination I immediately get excited about. I'm not sure why, since I love these chocolate mint puddle cookies, homemade thin mints, and these adorable chocolate mint sandwich cookies. Hmm okay maybe I do love chocolate and mint! Still, when I decided to make this cake, it wasn't so much for my enjoyment as it was for my friend Maggie, who was celebrating a December birthday! The cake was actually intended to be way more extravagant than what you see pictured. The Bon Appetit recipe called for splitting the cake in two, filling it with ganache, and then covering the whole thing in a chocolate glaze. I intended to go this route, but when 9 pm rolled around and I still had several steps left in the recipe, I decided to go a different direction. Sleep wins when you're seven months pregnant. 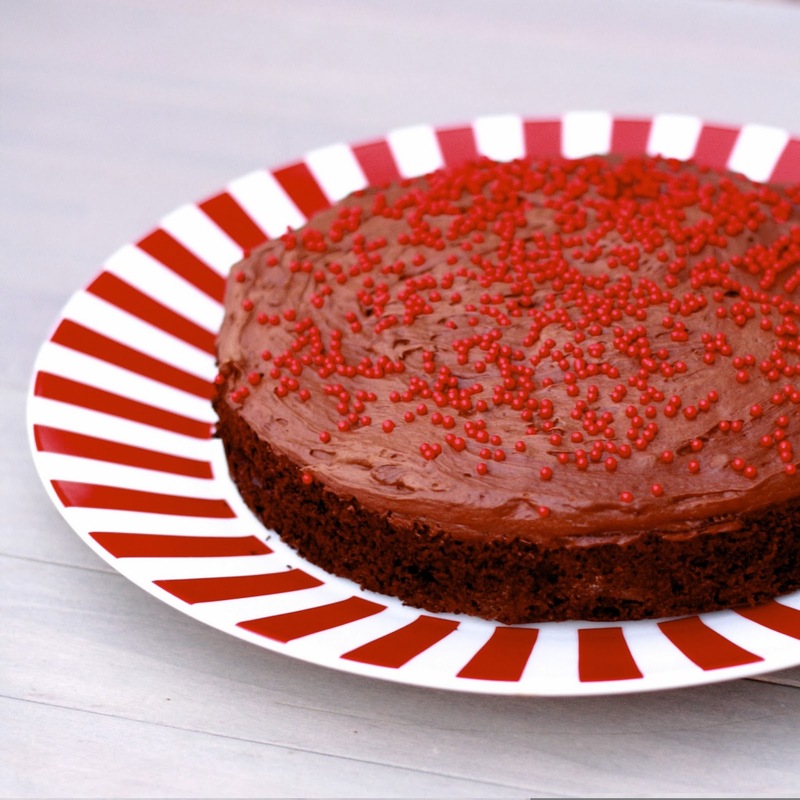 My version was just one cake layer, and the mint ganache served as frosting...I didn't even bother to try and cover the entire cake and instead spread the ganache over the top and decorated with sprinkles. I couldn't have been happier with my spin on this cake. 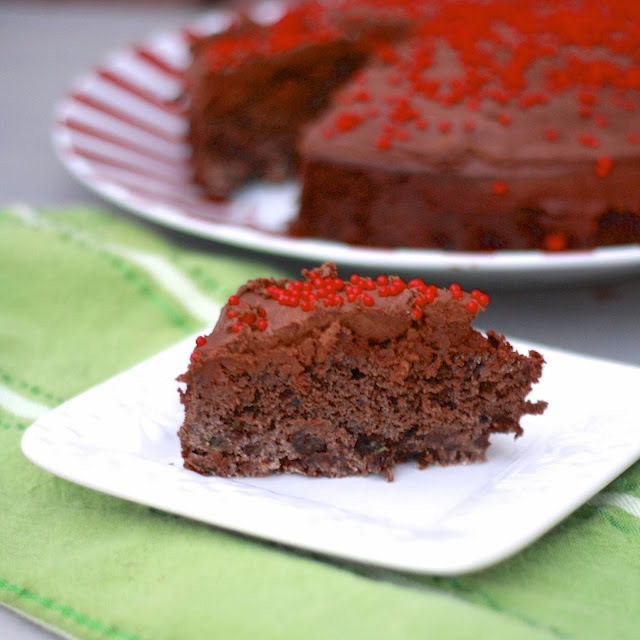 The cake is deeply chocolaty but the mint--by way of chopped Andes in the cake and peppermint extract in the ganache--shines through creating a perfect marriage between the two. Even without the extra steps, the cake manages to be a showstopper that would be a great addition to your Christmas dinner! Serve with a scoop of vanilla ice cream to really put it over the top! 1. To make the frosting, place the chocolate in a medium bowl. In a small saucepan, bring the cream and corn syrup to a simmer. Pour the cream mixture over the chocolate. Add extract and allow to stand for 1 minute before whisking until smooth. Allow filling to stand at room temperature while making cake. 2. To make the cake, preheat oven to 350F. Grease a 9-inch round cake pan and line with parchment paper. Grease and flour parchment and set aside. 3. Whisk flour, cocoa powder, salt, baking powder, and baking soda in a medium bowl. In the bowl of an electric mixer, beat butter until light and fluffy. Gradually beat in both sugars followed by the vanilla. Beat in eggs one at a time, beating well after each addition. Beat in dry ingredients, alternating with the buttermilk (2 additions of each). Stir in Andes mints and chocolate chips. 4. Pour batter into prepared pan. Bake cake for 50-60 minutes, until an inserted toothpick comes out clean. Allow cake to cool in pan for 5 minutes before turning cake out onto cooling rack, peeling off parchment, and cooling completely. 5. Beat chocolate frosting with an electric mixer until fluffy (about 30 seconds). 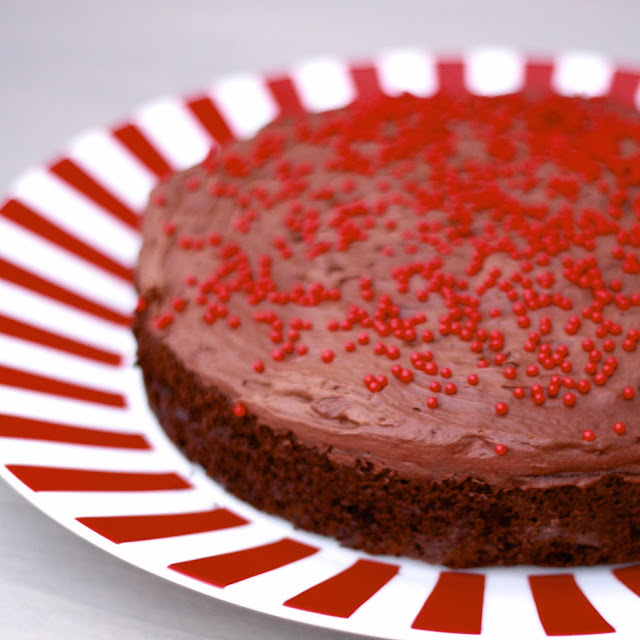 Spread frosting over cooled cake and decorate as desired. Cover cake and chill in fridge to set, but bring to room temperature before serving.